1. Make your Home page inviting with a compelling image of your work and a professional design. Be sure that your website is easily navigated. Frustrated visitors will just click away. 2. Craft your “About” page carefully, because it’s not all about you, it’s also about your website visitor. To keep them reading you need to create “emotional resonance.” Tell your story in an authentic, personal way, in the first person. Include your photo so they feel that they know you. Don’t get caught up in unintelligible artist statements that no one can decipher. 3. Use great images. 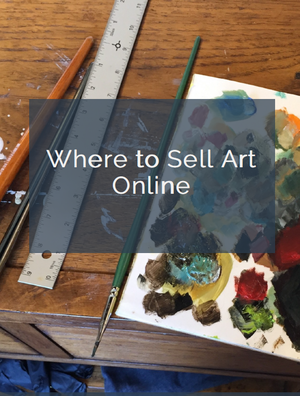 Here’s where visual artists have a great advantage. Present your work at its best by using professionally taken photographs. After all, you work hard to create your art. Don’t you deserve this? 4. Show your work in situ on your website. This helps the reader to imagine how that art might look in their own home or office. It gives a sense of scale, and can really show off what a beautiful artistic statement your work makes. Room views make it easy to see how your art can enhance their environment. When they get a great preview like an in situ photo, it’s an exciting first step to closing the sale. 5. Capture email addresses. Use a free service like Feedburner, or use MailChimp, FeedBlitz, AWeber or other provider to place an opt-in subscription box on your website. This simple step will help you gather that all-important list of people who are interested in your work. 6. Send out a newsletter to that list. Keeping in touch with your audience helps them to get to know you even better. It can take many contacts before people remember you and are ready to consider a purchase. An occasional email contact will keep your work in front of them. 7. Create a blog on your website. This is optional, but can be a wonderful addition that adds frequent content to enhance each visit to your site. But, if you feel that you can’t keep up with it or don’t care to write, pass on this. An abandoned blog makes you look out of business. 8. Show work in progress, videos of yourself working in the studio, or your technique. Keep it interesting and even educational. The more your audience knows about you and the work you do, they more they will remember you. 9. Links to your social media accounts should be easily seen on your website. Invite people to connect with you. When you gather likes, followers or fans, you can more easily communicate with them without the “intrusion” that they may feel from receiving email. You can also easily install plug-ins on your website that will share your Twitter or Facebook stream. 10. Share your blog and website content on social media – and share other people’s content as well. Part of being an effective networker is helping to promote others. This will come back to you in kind. See more of Manon Sander’s work on her very inviting website. great advice…i did change my about page after reading something similar on Artbiz blog. i just need to figure out the room view thing on photoshop…that’s a wonderful suggestion! Really, did Alyson post an article on this subject? A must read!! This is the most useful advice…and concise…I’ve seen in some time. hard copy and have it in front of me to begin some re-form. Very interesting and useful. I desperately need to increase my website gallery visibility. I would like to insert plug-ins with Facebook but I do not know how to do it. I would like to exchange links with more artist. I am on Fineartamerica for awhile but I can not say that I sell prints well. Carmen, since you are not using a WordPress platform for your website, you may not be able to show your Facebook or Twitter stream. But that doesn’t mean you can’t link to those sites. You could Invite visitors to connect with you on Facebook on your home page or your “About” page with a link to your Facebook profile. Excellent advice! It’s tough to balance between professional (potentially stuffy) and friendly (lacking any seriousness at all). Over the years I’ve made countless changes to my website and my “About the Artist” page and I fear that where it once was too loose and carefree (and downright ridiculous, impossible to be taken seriously) that now it is too up-tight. I’ve been attempting to talk to galleries in an attempt to get more local recognition and my biographical page is now just a CV and artist statement. I’m definitely going to look into a mailing list. The problem with artists is that when we are out of sight, we’re out of mind. With an email list, I can pop up in your mailbox with just a few words and an attention grabbing new work of art. Hopefully that will generate more website visits! Nora, One of the reasons I remember many artists is that their names pop up often. This is because they are engaged with their audience. You’re right, it is out of sight, out of mind. You don’t have to have ever met an artist personally to recall them. Make yourself memorable too! Great list, simple and concise but spot on. Just taking a good look at my site and tweaking it a bit so this list is going to be a great help!! Great list and good advice. Clear, to the point and easy to accomplish. Are there any articles on getting your work in front of magazine editors?